Gastrointestinal involvement by myeloid sarcomas is common and seen chiefly in small intestine. Isolated stomach involvement is rare with few cases reported in literature. ,, We discuss two cases of myeloid sarcoma presenting as a stomach mass with a view to highlight the diagnostic conundrum and pointers toward an accurate diagnosis. A 35-year-old man presented with a history of dyspepsia and abdominal discomfort since 5 months in June 2008. He had abdominal pain and malena since last 2 months. His complete blood counts revealed mild anemia. A gastroduodenoscopy revealed irregular nodular infiltrative lesion in mid-body involving mucosa and submucosa along posterior wall and lesser curvature of stomach [Figure 1]. An ultrasonography (USG) abdomen confirmed the stomach mass with enlarged peripancreatic nodes measuring 1.8 cm. Serum lactate dehydrogenase (LDH) was 567 IU/L and all other investigations were normal. Gastric biopsy done 1 month later revealed medium sized atypical monotonous cell population concentrating in the lamina propria with minimal submucosal spill. The cells had irregular nuclei with small nucleoli and scanty cytoplasm [Figure 2]a-d. The gastric epithelium was normal without lymphoepithelial lesion (LEL). On immunohistochemistry, tumor cells were strongly positive for LCA and negative for CD20 and CD3 with Ki67 labeling index about 80%. Inspite of the avid Ki67 as the CD20 expressing B-cell population was not overwhelming; a diagnosis of atypical lymphoid proliferation not likely to represent non-Hodgkins lymphoma was given. Patient was treated symptomatically. He came with worsening symptoms with increased gastric mass in the next 2 months. The repeat biopsy was akin to the previous biopsy but with increase in the lamina propria infiltrate. The staging bone marrow biopsy was labeled as myelodysplastic. Patient was treated with CHOP (cyclophosphomide, adriamycin, vincristine, prednisolone) chemotherapy without rituximab due to the absence of CD20. Immediately after the completion of chemotherapy, patient presented with vomiting and progressively increasing paraperesis. An MRI scan showed tiny foci of demyelination around vessels bilaterally and nodular deposits in spinal column with marked thickening of lower lumbar and sacral nerve roots. A cerebrospinal fluid (CSF) examination revealed blastic cells. Also observed was an 8 × 6 × 5 cm anterior abdominal wall mass and a core biopsy from this mass revealed sheets of blasts with prominent nucleoli, scanty cytoplasm and high proliferation invading abdominal muscles. These cells expressed LCA, CD43, C-kit, CD68 and myeloperoxidase strongly and were negative for CD20, CD3, CD30, CD163, CD34 and ALK1. In retrospect the lamina propria infiltrate in stomach too expressed similar myeloid markers and a diagnosis of myeloid or granulocytic sarcoma with primary gastric presentation was made. On reviewing the bone marrow retrospectively, it was hypercellular with shift to left in myeloid series with increased immaturity and increased promyelocytes and metamyelocytes. Although the blast count on aspirate was 15%, CD34 and ckit labeled at least 30% of cells in the trephine biopsy revising the diagnosis to AML-M2. There was no evidence of myelodysplastic syndrome. Patient was started on induction chemotherapy for AML but succumbed to progressive central nervous system disease (10 months after the first gastric biopsy in March 2009). Even terminally the total leukocyte count continued to be within normal range and no blasts were demonstrated in the peripheral blood. 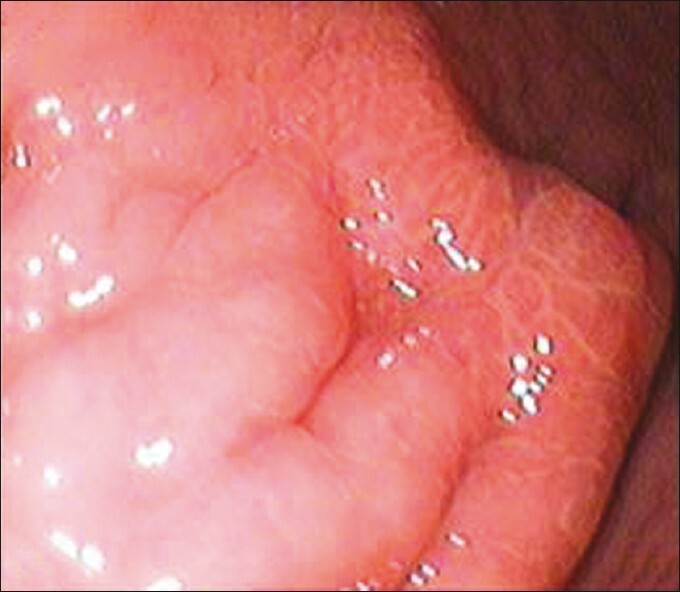 A 25-year-old man presented with abdominal discomfort and dyspepsia at another institute. His complete hemogram was within normal range. He underwent a gastroduodenoscopy which is showed irregular thickening of the mucosa and a diffusely infiltrated stomach wall. 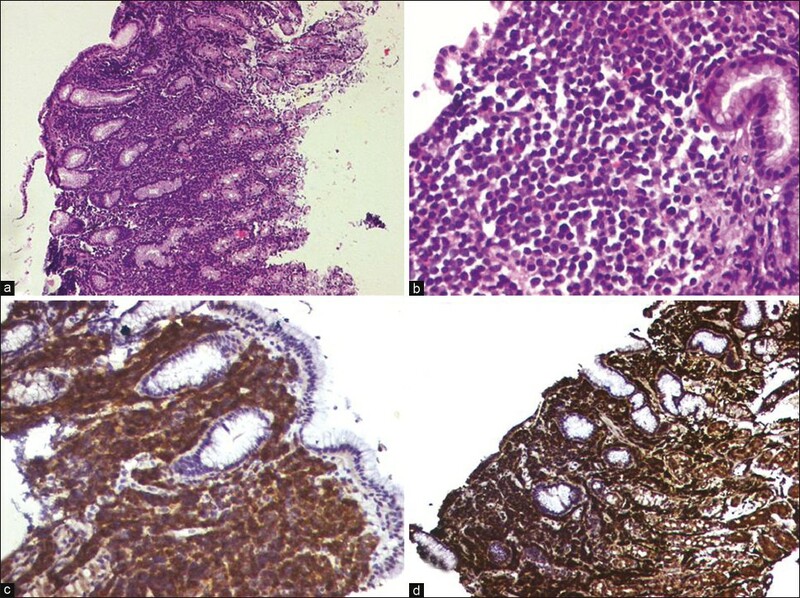 The gastric biopsy was submitted at our institute as a referral case and showed small atypical tumor cells chiefly in the superficial part of the lamina propria [Figure 3]. However, deeper planes of the biopsy did not reveal any abnormal cells and there were no lymphoepithelial lesions (LEL). On immunohistochemistry, tumor cells were positive for LCA and negative for CD3, CD20, CD10 and had a 80% MIB1 labeling index. In view of LCA positivity and blastic nature of cells, presence of eosinophils and myelocytes within the infiltrate additional markers for myeloid sarcoma were performed. Tumor cells expressed CD34, C-kit and myeloperoxidase (MPO), thus the diagnosis of gastric myeloid sarcoma was made. Subsequent to the biopsy patient developed severe acute intestinal obstruction and underwent emergency small bowel resection. Though the peripheral blood had no blasts, the postoperative bone marrow aspirate confirmed the diagnosis of AML with differentiation (AML-M2:FAB classification). Postoperatively patient had poor general condition and hence could not be started on chemotherapy. Within 15 days of surgery patient succumbed to disease dissemination. Gastric MS is rare with handful of case reports in literature. ,, We discuss the two cases of primary gastric MS, stressing the high chance of misdiagnosis in gastric MS in patients without obvious leukemic presentation and with a dominant gastric mass. 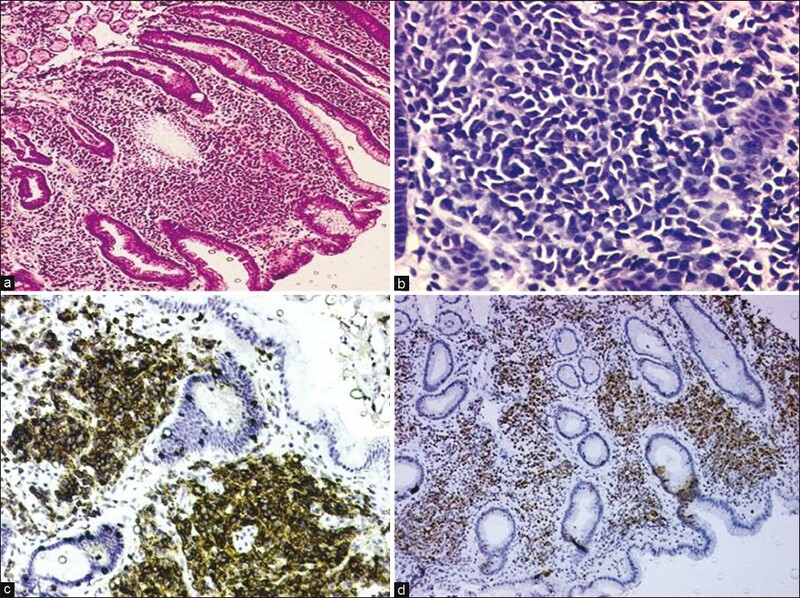 On gastric biopsy, a diagnosis of MS was difficult in the first case due to the lack of cells of myeloid maturing series and eosinophils (commonly seen with MS) along with the tumor cells. The scanty amount of cytoplasm and shrinkage of tumor cells made recognition of their blastic nature difficult and lead to misinterpretation as a lymphoid cell proliferation. The intermediate size of the cells and coarse chromatin should make pathologist think of blastic malignancy. As size of cells was small large cell lymphomas were ruled out and MALT lymphoma was considered. These two cases highlight that in a LCA-positive tumor with CD20 and CD3 negativity, a myeloid sarcoma should be ruled out in the GIT. The monotony of the tumor population, top heavy infiltrate concentrated in lamina propria, lack of plasma cells and LEL (ruling out a MALT lymphoma), failure to express B or T-cell antigens and high proliferation index (80%) should make a pathologist think of a blastic or precursor myeloid proliferation. In literature, the most sensitive markers for MS described are MPO and CD117 for myeloid differentiation while CD68 and CD163 are specific for monocytic precursors. CD34 expression in MS is commonly associated with the cases with CML/MDS than with AML. As most of the markers for MS overlap with lymphomas and nonhematolymphoid tumors it is essential to use a wide panel of myelomonocytic markers for accurate diagnosis of MS. The prognosis of gastric MS appears poor mainly due to local complications superseding an eminent leukemic dissemination as observed in our study and also as noted in earlier reports. Both these patient's has bone marrow involved by AML with differentiation (FAB-M2) which suggests that gastric involvement by MS was an indicator of disseminated disease. From the stormy clinical course in both patients, it is clear that delayed diagnosis leads to eventual death. A prompt and accurate diagnosis of MS requires high index of suspicion with appropriate panel of immunohistochemistry and salient histological features listed above could help accurate recognition with earlier therapy and improved survival. 1. Byrd JC, Edenfield WJ, Shields DJ, Dawson NA. Extramedullary myeloid cell tumors in acute nonlymphocytic leukemia: A critical review. J Clin Oncol 1995;13:1800-16. 2. Neiman RS, Barcos M, Berard C, Bonner H, Mann R, Rydell RE, et al. Granulocytic sarcoma: A clinicopathologic study of 61 biopsied cases. Cancer 1981;48:1426-37. 3. Derenzini E, Paolini S, Martinelli G, Campidelli C, Grazi GL, Calabrese C, et al. Extramedullary myeloid tumour of the stomach and duodenum presenting without acute myeloblastic leukemia: A diagnostic and therapeutic challenge. Leuk Lymphoma 2008;49:159-62. 4. Wang WL, Lin JT, Wang HP. Myeloid sarcoma of the stomach. Gastrointest Endosc 2008;68:1193-4. 5. Chennareddy SB, Chennareddy SP, Polidori G, Eisenberg L, Saleh HA, Bergsman KL. Gastric granulocytic sarcoma as a cause of acute upper gastrointestinal bleeding. Am J Gastroenterol 1996;91:609-11. 6. Meis JM, Butler JJ, Osborne BM, Manning JT. Granulocytic sarcoma in nonleukemic patients. Cancer 1986;58:2697-09. 7. Breccia M, Mandelli F, Petti MC, D'Andrea M, Pescarmona E, Pileri SA, et al. Clinico-pathological characteristics of myeloid sarcoma at diagnosis and during follow-up: Report of 12 cases from a single institution. Leuk Res 2004;28:1165-9. 8. Chang CC, Eshoa C, Kampalath B, Shidham VB, Perkins S. Immunophenotypic profile of myeloid cells in granulocytic sarcoma by immunohistochemistry. Correlation with blast differentiation in bone marrow. Am J Clin Pathol 2000;114:807-11. 9. Traweek ST, Arber DA, Rappaport H. Extramedullary myeloid cell tumors. An immunohistochemical and morphological study of 28 cases. Am J Surg Pathol 1993;17:1011-9.